Brinton Lake Dermatology offers a full range of cosmetic and laser procedures, such as Botox, wrinkle fillers and laser treatments. Our goal is to enhance your natural beauty using the latest and most effective products and technologies. At Brinton Lake Dermatology, we are well aware of the effects of sun, age and the environment on your skin, and we pride ourselves on the broad range of products and services that we can provide in order to renew your skin’s appearance. We have provided cosmetic dermatology services to patients in the Delaware and Chester County areas for 25 years. Refresh With . . .
Want to turn back the clock on your skin? The chemical peel, one of the simplest procedures we offer, can leave your skin softer, brighter and smoother than it’s felt in years, in as little as 15 minutes. Our corrective facial is a customized skin care treatment that is designed to target specific problems such as breakouts, dehydration, fine lines, wrinkles or other concerns that you may have with your skin. 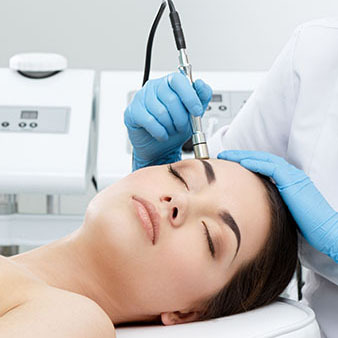 Epidermal Leveling represents the latest thinking in skin rejuvenation. The procedure will leave your skin with a new radiance and smoother texture. Relax Wrinkles . . . The injection of Botulinum Toxin A, better known as Botox® or Dysport™ is one of the most popular cosmetic procedures in the U.S. And it is a popular choice for good reason. It’s simple, quick, requires no anesthesia or downtime, and it results in a noticeable smoothing of the wrinkles in the treated area. While we can’t stop Mother Nature, Brinton Lake Dermatology offers many options (including Belotero®, Restylane®, Perlane®, Juvederm®, Radiesse®, Sculptra® and Artefill®) to help ease the wrinkles and creases that come along with age — dermal fillers are a wonderful option for many patients. Reduce Hair With . . .
Brinton Lake Dermatology uses a diode hair reduction/removal system that is the first technology to use combined energies to effectively and gently remove hair of many colors and types from all skin tones. These gentle, minimal or no downtime treatments are used to improve the cosmetic appearance of the face, neck or body. Brinton Lake Dermatology offers a variety of laser treatments to fit all your skin needs. Speedy, gentle and natural microdermabrasion may offer just what you need. This treatment is also a great alternative for patients with sensitive skin or those who have not gotten the results they desired with facials alone. Remove Unsightly Veins. . .
Sclerotherapy is a well-proven, non-surgical option to treat varicose and spider veins. It has been used since the early 1900s and offers our patients a safe, virtually no downtime option with very little discomfort. The Vbeam Perfecta Laser offers a safe, effective non-invasive approach to elimination of unsightly red blood vessels and leg veins.